Fuel services provider Top Oil, has officially opened its latest forecourt in Ballyvolane, County Cork. The new multi-million-euro investment will employ over 80 people, from the surrounding area in North Cork bringing a wide range of local amenities and providing an economic boost to the Cork area. The new 3-acre site is located on the west side of Ballyhooly Road, close to the junction with the North Ring road, in Cork city and took just over eight months to complete. This forecourt is the latest location for Top Oil in Cork, and is evidence of the continued progress for Top Oil’s retail division Top Sirio. The new 24-hour forecourt at Ballyvolane offers its customers a wide variety of services. The official launch of the new forecourt was undertaken by local FF TD Billy Kelleher. 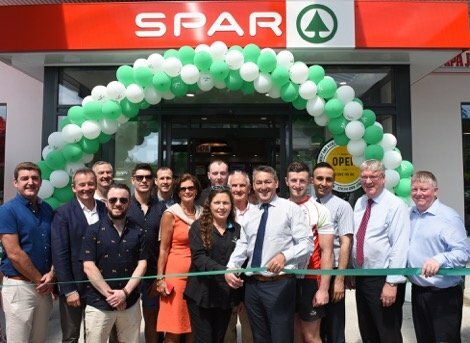 Pat McDonagh, Supermacs Chief Executive, was also in attendance as were Fair City stars, Ryan Andrews and Dave O’Sullivan as well as Cork Hurling star, Patrick Horgan.